Looking up at the east facade from Museum Park. Superstructure has officially topped out at One Thousand Museum, a residential condo tower in Downtown Miami from the office of the late Zaha Hadid, a Pritzker Prize winning architect of international acclaim. Plaza Construction is leading the realization of the formally unique tower. One Thousand Museum (center) from Museum Park. The 62-story tower joins a more modestly sized residential building nearing completion in New York as the first residential projects from Zaha Hadid in the United States. Hadid's Miami tower is located in Downtown Miami, adjacent to Museum Park and its two new museums, the Perez Art Museum and the recently completed Frost Science Museum. At the very top of the tower, an Aquatic Center and Sky Lounge will provide residents with an indoor pool and private event space with stunning views to the beach and the city. The roof of the tower has also been designed to accommodate Miami's first private helipad on a residential tower. Preparing the rebar for the roof concrete pour. Roof and helipad under construction. View east from the roof. GFRC clad structure at the roof. Levels 10 through 14 will feature townhouse residences, with multi-story, half floor layouts. Levels 15 through 49 will feature 4-bedroom half-floor residences, followed by 5-bedroom full-floor penthouses on levels 50 to 57. A duplex penthouse on levels 58 and 59 will feature a double height great room with terrace and a private pool. Southeast corner view from a penthouse interior. Penthouse terrace at the east facade. View east from a penthouse terrace. Looking down on Museum Park from a penthouse terrace. After floor 15, Hadid's organic tower structure transitions from the traditional poured-in-place concrete with removable wood form-work to an innovative new solution, GFRC panels. Fabricated in Dubai, the glass-fiber reinforced concrete (GFRC) panels serve as both form-work and outer shell, saving much construction time. One Thousand Museum is the first tower in the U.S. to utilize the panels as permanent form-work and cladding. Close-up of the GFRC panels on the southeast corner of the tower. Living room with southeast balcony. 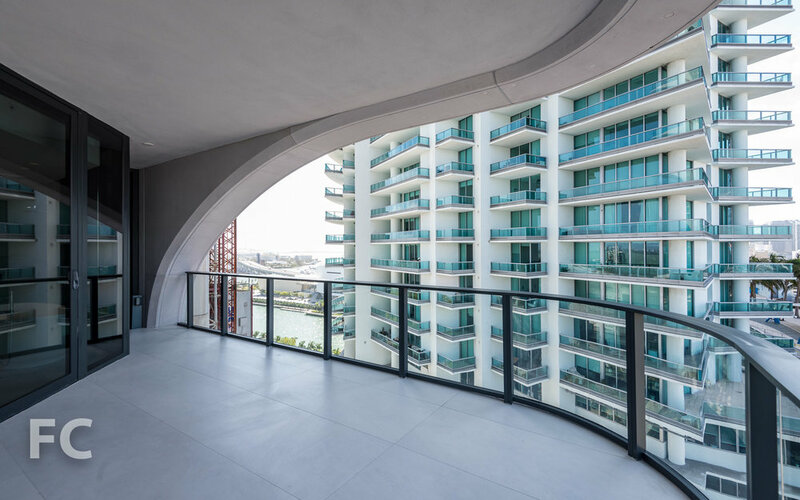 Architects: Zaha Hadid Architects (Design Architect), O’Donnell Dannwolf & Partners Architects (Executive Architect); Landscape Architect: Enea Garden Design; Structural Engineer: DeSimone Consulting Engineers; Developer: 1000 Biscayne Tower, LLC; Construction: Plaza Construction; Program: Residential, Retail; Location: Downtown Miami; Completion: 2018.